Unified and undefeated heavyweight Champion Anthony Joshua spoke to members of the media on a SHOWTIME-hosted conference call to discuss his upcoming title defense against IBF mandatory challenger Carlos Takam. The fight will be televised LIVE on SHOWTIME at 5 p.m. ET/2 p.m. PT from Principality Stadium in Cardiff, Wales. The British sensation Joshua (19-0, 19 KOs) and Takam (35-3-1, 27 KOs) will meet in front of what is expected to be more than 70,000 boxing at Welsh’s national stadium. 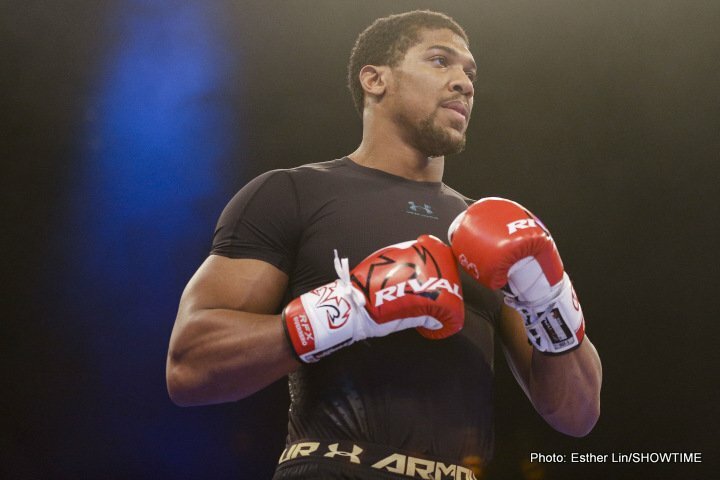 “This will be the fifth Anthony Joshua fight that will be telecast on SHOWTIME here in the states. We’re very proud of our association with A.J. and with Matchroom and it is part of giving fans the biggest fights and the best fighters. A.J. definitely fits that criteria. He is without a doubt the consensus No. 1 heavyweight in the world. We last saw him in April in a thrilling, career-defining fight and knockout of Wladimir Klitschko in front of a record crowd of 90,000 people. That fight was broadcast in over 150 countries, including live in the U.S. on SHOWTIME. On Oct. 28 we expect another spectacle of similar scale. He’s got an experienced challenger and we expect a rabid crowd of 70,000 and we are proud to bring it you on SHOWTIME starting live at 5 p.m. Eastern and 2 p.m. Pacific.